Congratulations, you've just landed on a page full of exciting dolls and toys, from one of Dreamworks biggest, box office smashes of all time; How to Train Your Dragon 2. Such a huge hit from the American based studio...and the weird thing is, it's a sequel! Known across Europe as Dragons, it's hard to find anyone who doesn't like this animated movie! As an animator myself, I understand how complicated it can be to get all the ingredients right in an animated sequence, in order to make audiences fall in love with it...but haven't Dreamworks got their recipe right this time?! I've said it once, and I'll say it again (...and again), with every great animated movie, comes even better animated dolls and toys...and in the case of How to Train Your Dragon 2, I mean, grrrrreat! Whether or not you’re a fan of Hiccup, or the utterly adorable and uber cute, Toothless – you’re in the right place., to get your hands on the most popular dolls and toys there are. On this page, you'll find all you need in the way of dolls from the best Dragon animation to come along in a loooooong time. 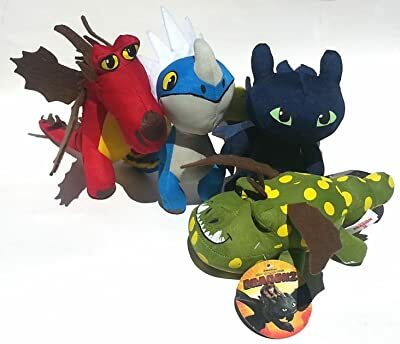 However, if you can't wait any longer you can go straight to Amazon.com's dedicated page full of How to Train Your Dragon dolls and toys, right here now! Don't forget to bookmark this page (or pin it on dolls pinterest board) and keep checking back, as more and more dolls and toys will be added, as more become available. This set was an easy choice to present first on this page! Not one, not two...but four of the best Dragons from How to Train Your Dragon 2. 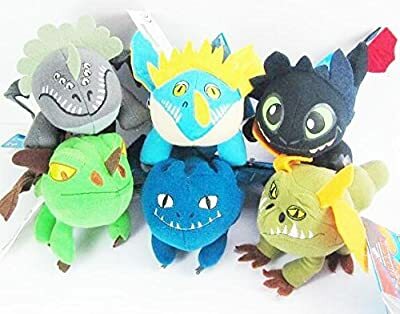 Whether or not you love Toothless, Meatlug, Stormfly or Hookfang...they can all be yours in this fabulous little collection of plush dolls from the one of the greatest animated movies of recent time! As every good Dragon trainer knows, your dragon can ome in a variety of shapes and sizes, and this little collection is no exception. Ranging from 9 to 14 inches tall, each little HTTYD2 doll brings something special and different to your collection! Which HoW to train your dragon 2, Dragon are YOU going to be training? Sooooo, you can train a dragon...but which one are you taking? Do you have a soft spot for Toothless? Do you want Gronkle or Meatlug? Does Skullcrusher go better for you? Or is it Stormfly? If it isn't a Nadder, maybe it's a different dragon all together? Well, if it's isn't one of the most popular Dragons to come out of the How to Train Your Dragon movies! It's Toothless! But, this isn't any ordinary Toothless doll...you squeeze Toothless, Toothless growls. Yup, that's right, it's just a plushie, it comes with sound effects to give added quality. It's clear to see, just by looking at it, why this little extra special plush doll has been getting five star reviews over at Amazon.com. If you're buying this for a little one, this Toothless is recommended for children over 4 years old and it comes with batteries (hurrah to that)! Well, we have the large plush Dragon set featured above, so I wanted to bring you more...but this time there are more, and they're smaller...and guess what? They're cheaper - winner! So, it's easy to see, here you can take home a collection of How to Train Your Dragon 2, dragons! Simply made, but forever treasured. Size wise, these little guys measure up from 3 to 5 inches tall...so essentially, even for the littlest of hands, they're easy to take around with their little trainer friends...and bigger trainers, alike! Go on, don't just train one dragon - train a bunch of them! Now, this is Toothless doll is a little bit special. He's from the huge stuffed toy company Build-A-Bear. 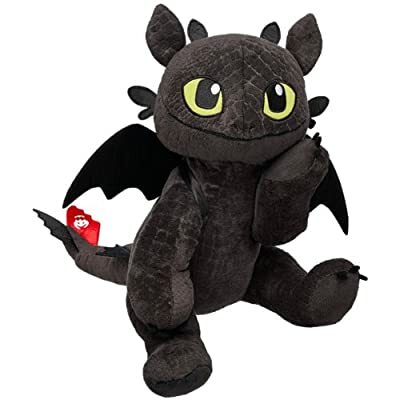 When you order him, he'll arrive unstuffed, so your little one (or bigger one, because of course, not all HTTYD2 fans are young'uns) can take him to any Build-A-Bear location, so that they can bring him to life in their hands. 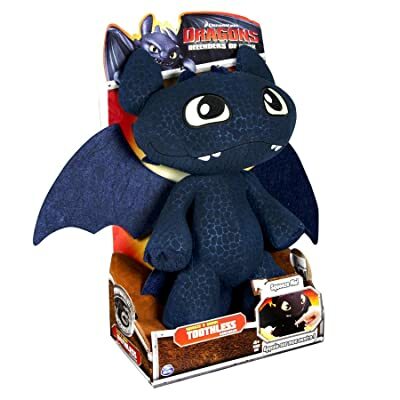 This Toothless doll will stand at a considerable 17 inches, and as he's from Build-A-Build, you can personalize him with clothing and accessories, so he truly becomes your own dragon, that you can train! Ahhhhhh, I can't get enough of the cuteness of this Toothless doll that you can bring to life....sooooooo cute! This gem is really more of a Toothless toy, and what an incredible toy at that...endorsed by the big number of five star reviews it gets! Not only is it the biggest Toothless toy around at the moment, from head to tail it measures a whooping 23inches (58cms) - woah! Let's just take a second to take in the review comments: "this one is a must have", "best dragon figure I've ever owned" and "the item is of good quality and looks stunning" are but a few of the best bits from customer feedback. So, what are you waiting for? 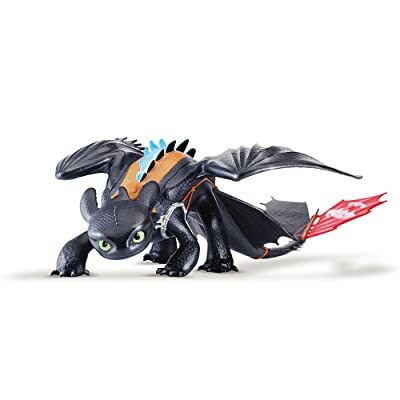 Snap up this fabulous Toothless toy before it's too late. Bookmark this page and keep checking back for more How to Train Your Dragon 2 Dolls! Thanks for visiting, and don't forget to pin your favourite toys to your favourite Pinterest pin boards!